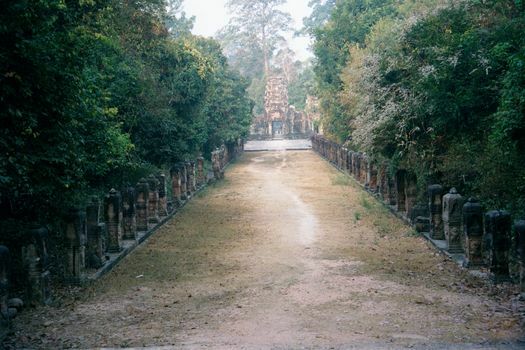 Just north of the northeast corner of Angkor Thom, a battle was fought by Jayavarman VII against the Chams, whose king was killed on the spot. 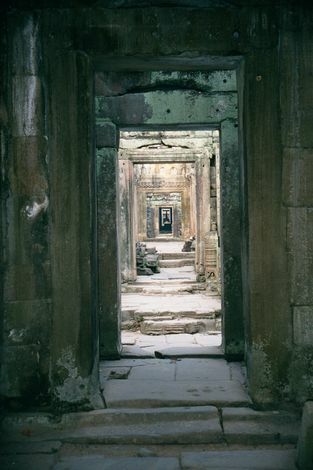 Jayavarman ordered the construction of a commemorative city, whose ruins are known today as Preah Khan, "sacred sword." 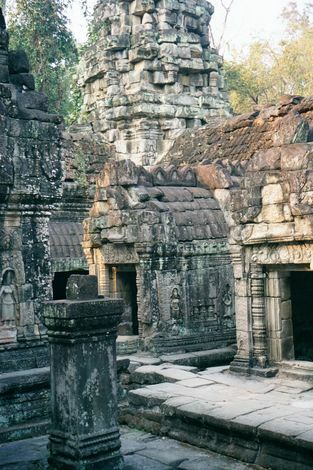 Its rectangular walls extend 800 by 700 meters and mostly enclose forest; on the main east-west axis, however, and just west of center, a temple was built of more permanent materials. 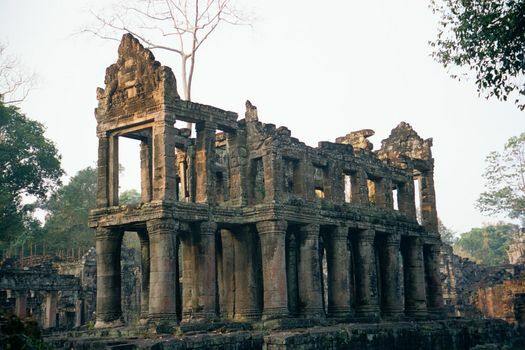 It's today's Preah Khan. 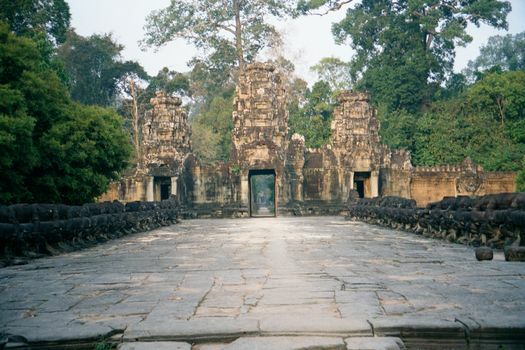 The ceremonial approach to Preah Khan was from the east, where Jayavarman excavated a reservoir, the Jayatataka Baray. 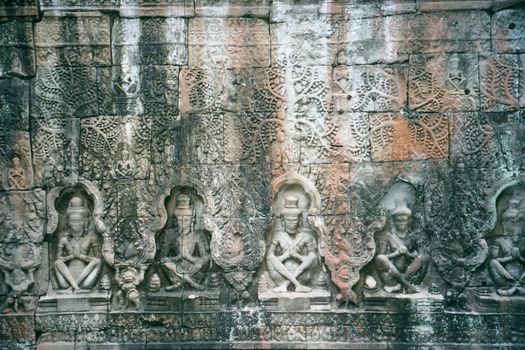 (Like so many things at Angkor, it was rectangular, measuring 900 meters north-south and 3,500 east-west. 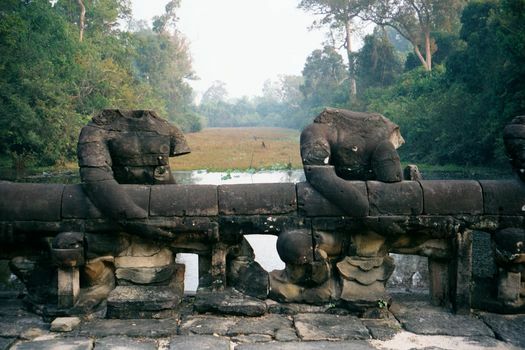 That may sound large, but Angkor already had two bigger barays, one on either side of Angkor Thom.) Behind the camera is the landing at which he might alight from his barge and proceed westward to the city he had commissioned. Its main gate lies in the distance. The bollards that line the 200 meter path contained small Buddha images, but they were removed by Jayavarman's son, who reverted to Hinduism. 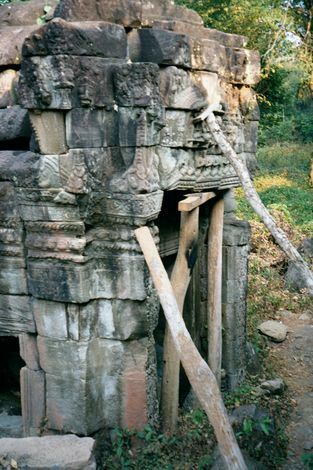 A naga bridge, like those leading to Angkor Wat and Angkor Thom, leads to Preah Khan's eastern gate or gopura. 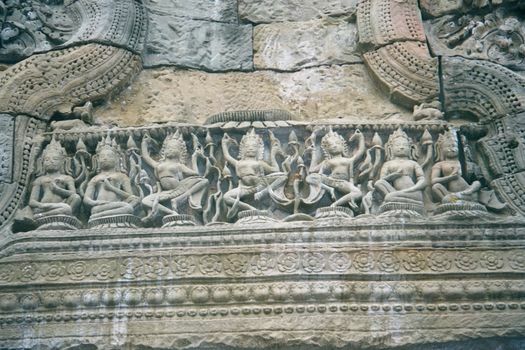 The demons (on the right) and gods (on the left) have all been decapitated, victims of the illicit art trade. A close-up, showing the butchery and the city moat. 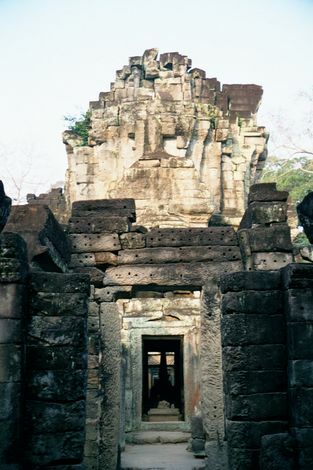 The view inside and along the main axis toward the temple sanctuary. Originally, doors would have blocked this long view. Off to the right and just inside the east gate is this building, whose design is unique at Angkor. There is no trace of a staircase. The building's purpose is unknown, although it has been speculatively and oddly designated as a granary. Back on the main east-west axis of the temple there is a room called The Hall of Dancers, a name based on its many trimmings like this one of rather salamanderish apsaras. Approaching the sanctuary. The layout, centered on the sanctuary, is cruciform. Turn left (south) at the crossing, and you head to a section of the temple built for ancestor worship. Go straight (west), and you enter a section dedicated to Vishnu. Turn right (north), and you are in a section dedicated to Shiva. The sanctuary is surrounded by a cluster of small buildings. Originally, the sanctuary held a statue of Jayavarman's father in the guise of the Compassionate Buddha. 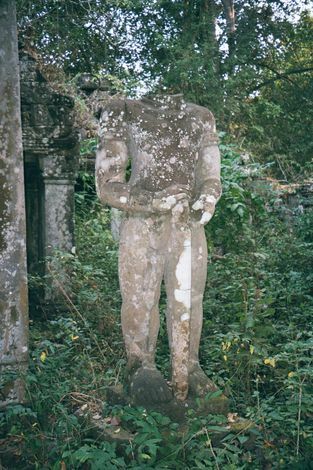 After Jayavarman's death, the statue was destroyed and the temple presumably dedicated to Shiva or Vishnu. 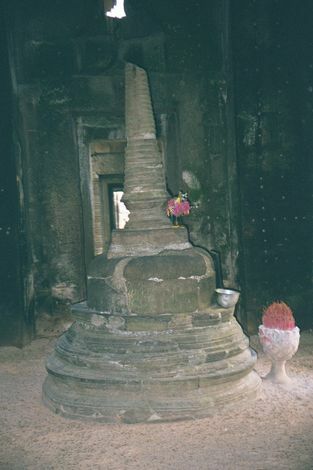 Since the 16th century, it has contained this plain stupa or pagoda. A nearby line of Buddhas was recarved during the Hindu interregnum into a line of prayerful hermits or rishis. Off to the south of the sanctuary, almost impenetrable thickets reclaim the area designated for ancestor worship.